The craze continues so manufacturers keep improving the pellet smoker/grill category and Grilla is no exception. I cooked on the original Grilla about seven years ago at their factory in Holland, Michigan and very much enjoyed the uniqueness and durability. The Silverback is a newer entry for Grilla and is built along the lines of several top manufacturers in the barrel-bodied style to resemble the old traditional home-built smokers of long ago. In this review I will set out to try to break down the pros and cons of this product as best I can. 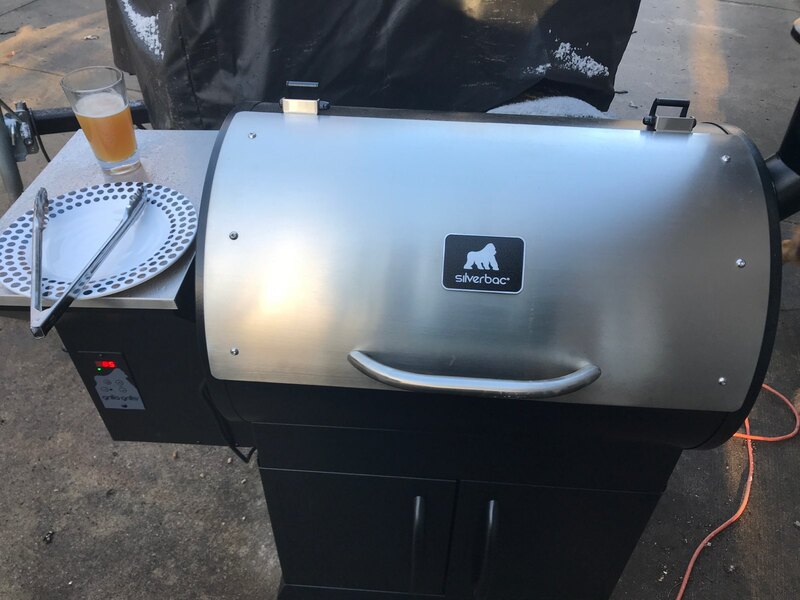 As a mea culpa, I must admit that the acting manager of Grilla, Mark Graham is an old friend from my former life as a grill and smoker manufacturers rep.
To be fair, I have started to get down on the whole pellet grill thing as a true bbq snob should… so I thought. After testing this unit for a month and a half, I have fallen in love with pellets all over again and who doesn’t want to be in love? My biggest take-away is that if this style of smoking gets more folks into bbq, why knock it. As it turns out, the product I made on the Silverback was nothing short of total tastiness and I might be hard pressed to say it wasn’t done on charcoal. This doesn’t mean that I am not still a snob, I am. This thing comes packaged in a very scientific configuration which would appear to alleviate most chances of shipping damage which is good as Grilla pretty much LTL’s all of the product. I did find all of the parts in perfect shape with no damage. I must say that the assembly instructions were very easy to follow and unintimidating. The only thing that I might add is to wear light gloves as the stainless lid is very well wrapped, but I did get metal slivers. The entire assembly took just under one hour and it was a process that anybody can complete. I should add the aid of a Schmohz Bonecrusher Stout. I highly recommend you follow ALL of my steps. Next I filled the hopper, plugged it into my trusty extension cord and powered it up. Hit the start button and then let it burn for an hour to cure the paint and burn off any residual oils from manufacturing. Time for another beer and for this, I elected to go with an M43 by Old Nation Brewing Co. and actually even finished the cook with the coveted ME-MI. 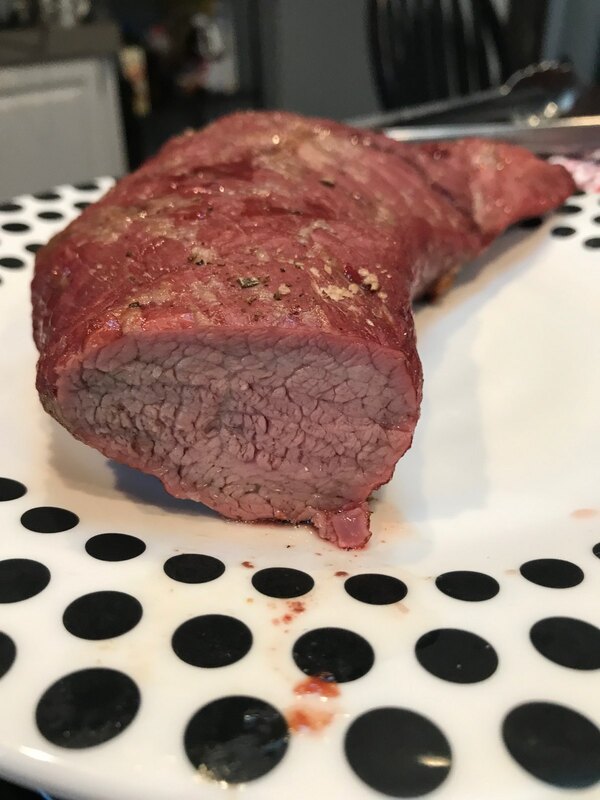 For my first cook, I did a Tri-Tip from Sobie Meats and I have to say it came out perfectly. I set the temperature at 250 and let it go for a a half hour. 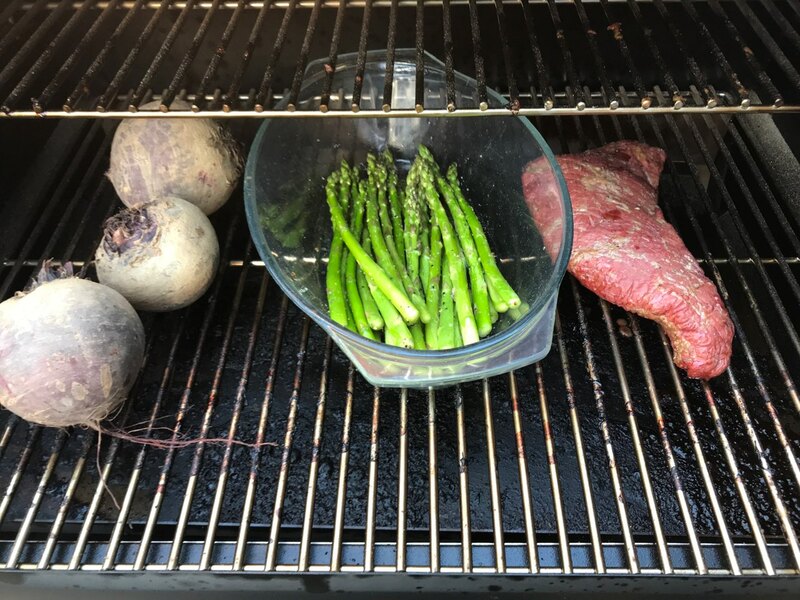 I then threw in a few beets (Jop’s head is now exploding) and continued the smoking session for another half hour. Then I placed a pan of asparagus coated with garlic evoo from Old World Olive Co. and some secret spices. I left this all in for another twenty minutes and checked the temp on the meat which was at a perfect 132 so I pulled it all. 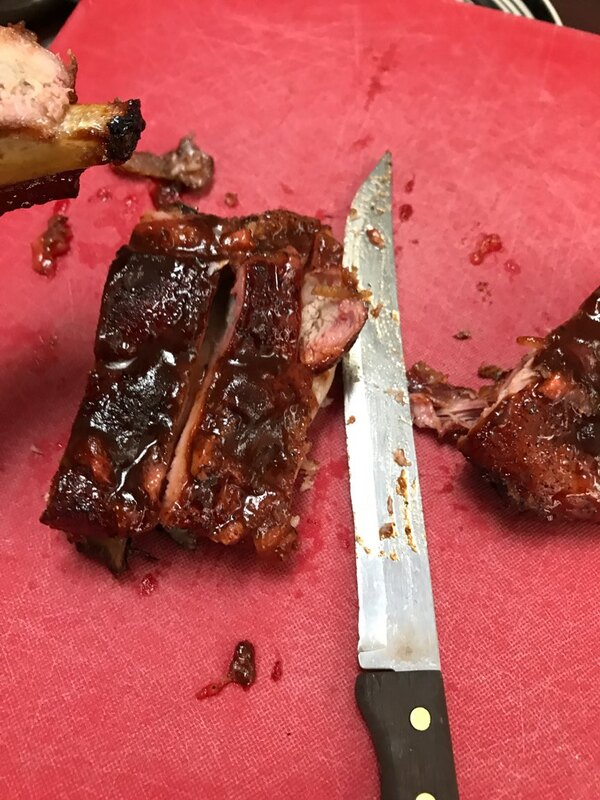 The next cook just had to be ribs even though I rarely eat them anymore. Back to Sobies to pick up some nice babybacks. 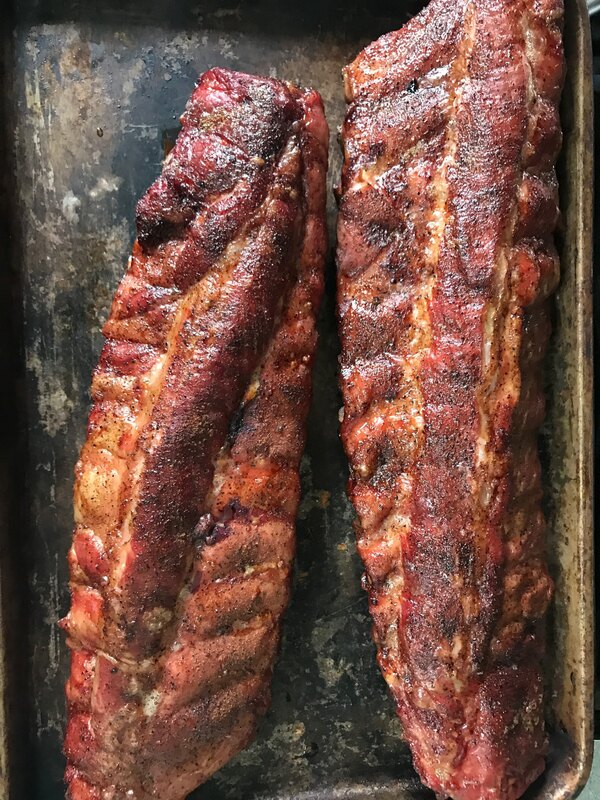 After my typical prep, I fired up the Silverback and put several styles of seasoned babybacks in. The green bag is a Chimichurri style. I would add that the unit is top-heavy because of the thick stainless lid. I would highly recommend storing a few bags of pellets in the cabinet to add ballast. Mine now has a dented front as it tipped over while pulling it out of the garage. 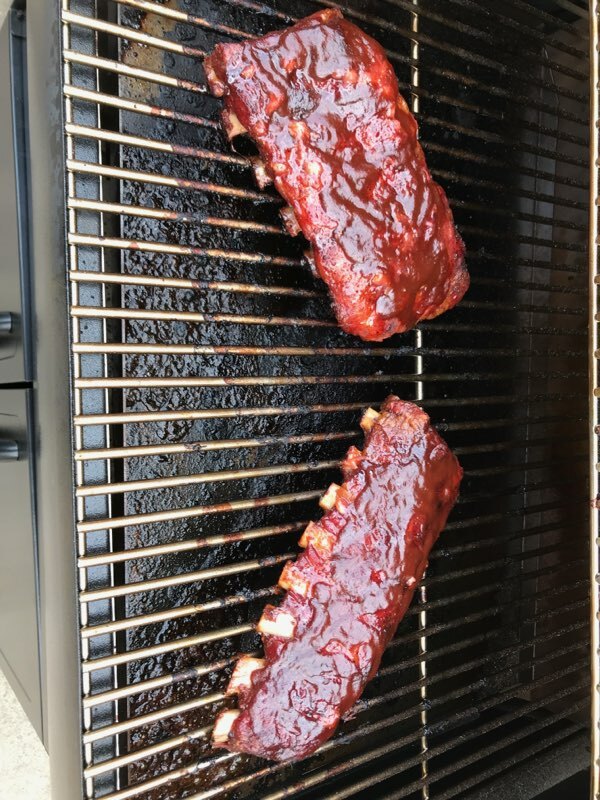 After about three hours the ribs were ready to sauce. Now they are done so lets pull. 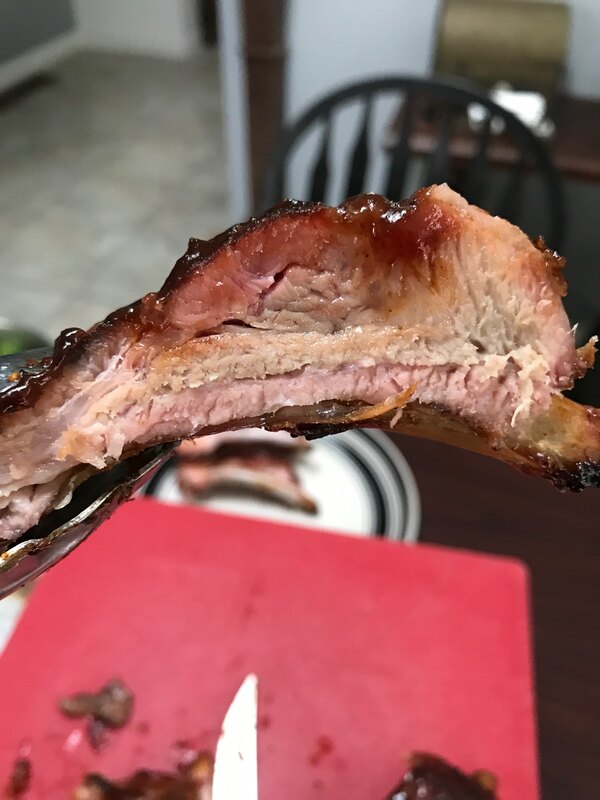 I have to say that the smoke ring was perfect, the ribs were moist, and most importantly, the temperature control was flawless. I did not use the meat probe yet as I simply don’t ever feel the need (snob). It did seem to use less fuel than my last pellet smoker which also worked well and resides in Jop’s garage now (along-side several other grills that use to populate my deck). Don’t you just want to chomp on this? With the success that I have had falling back in love with pellets, I can’t wait to do a brisket which is still my all-time favorite protein to smoke. This thing might have to stay at my house because it fills a gap in my repertoire plus makes it easy to do a pop-up que. Anyway, honestly, the thing is better than I thought and now I’m gonna have to eat crow. Hey, I wonder how that would smoke? Smoke control – very nice with a simple selection of temperature to control the level of smoke vs heat. Overal product quality and construction – seems pretty rugged and well engineered. 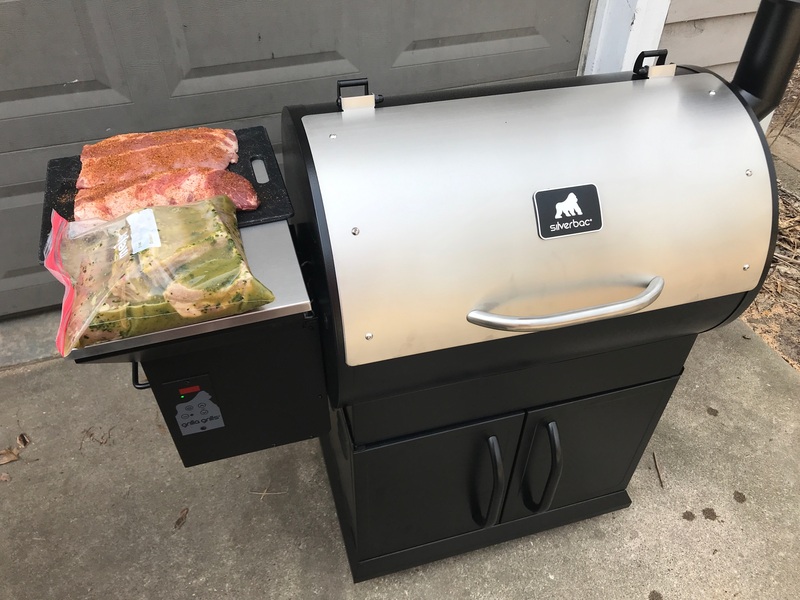 I hope this helps in your quest for a pellet smoker and I will put The Grillin’s Guys stamp of approval on the Silverback. Made a 24lb. Turkey, butter and garlic. Everybody loved it, can’t wait for the next item to smoke!! That’s great news! Turkey breasts are another super cool way to smoke and can be combined with other items to conserve space. Pork butts are very easy and rewarding as well. Good on ya bruh!